Swim and snorkel It would be insane indeed to miss out on an opportunity to experience the waters of Hawaii. Go for a swim. Chances are, you'll probably book yourself in a hotel that's just a few feet away from the beach. 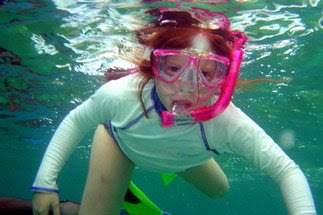 While you're in the water, try snorkeling off the island. Molokini is a very popular site in Hawaii so if you want to check out the most impressive underwater views, this is the best spot. The marine preserve on Molokini is one of the most fantastic in Hawaii, which explains the high esteem it continues to receive from tourists and locals alike. For Molokini and for most of the dive and snorkeling sites in Hawaii, you'll need a boat to reach the location. Boats are built with glass bottoms, so even non-swimmers can enjoy the view underwater without getting themselves wet. Take a cruise If you're traveling to Hawaii in winter, you're in luck. This is the season when humpback whales come to visit. The best way to get up close (or at least, as close as you can) to these wonderful creatures is to take a catamaran cruise. Book one from any of the main islands of Hawaii such as Honolulu, Oahu, Maui or Kauai. You and your family will be able to experience the marvel of these gigantic creatures. Get up close and personal with a volcano Hawaii can thank its numerous volcanoes for its rich, verdant soil. So if you're traveling to Hawaii, try to visit one of these spitfires and witness something you'll never forget. The most famous volcano in Hawaii is Kilauea Volcano located in the Big Island. It's active, so expect a few activities now and then. Since the beginning of 2000, Kilauea has spewed off enough lava to cover nearly 40 sq. miles, effectively expanding the southern part of its shore. The view, along with the possibility of watching the birth of a new island happen will keep you enchanted for a long time. Play golf Are you a land animal? If you're the type who prefers to stay on shore, why not try your swing in Hawaii? It boasts of world-class golf courses and facilities. Nowhere else can you find fairways framed by beautiful scenery and a view of the Pacific Ocean. Six of the islands offer over 80 courses, so you're bound to find a perfect place for a tee-off wherever you may be. Sample the cuisine If you've always dreamed of tasting only authentic Polynesian cooking, travel to Hawaii for a delicious luau. A luau is a one-of-a-kind experience in gustatory delight, rich in flavor, history, color and of course, taste. There's always traditional dance and music involved, so it's truly a feast for the senses. How's the best way to enjoy Hawaii? To find the be best Hawaii tour packages. For more information, please visit Tours4Fun.com.